Summer Camp for Grown Ups! Thats the best description of what happens in Mesa, AZ in January, February and March. There is so much going on! We are staying at Monte Vista Village RV Resort and the activities are endless; Tennis, Pickleball, hiking, biking, shuffleboard, swimming, softball, dancing, silversmithing, bootcamp, arobics, yoga, card making, quilting, jewelry, rock stuff, every card game you can think of, movie nights, shows, dinners, breakfasts, ice cream, happy hours, and so on, and so on! Paul and I are not new to the resort lifestyle but we are new to this park, having visited it for events in the past we decided to give it a try for three months this winter. So far we have been to a steak fry, a pancake breakfast, happy hours, a show out in town, a magician, dancing at the Legion Hall, pinnocle, cribbage, dinner at friends, pickleball, tennis and Denise has been doing bootcamp. I am not sure why I put myself through bootcamp but it feels good afterwards until the pain sets in! I took a class in silversmithing and made a really cute bracelet. I made this from a single strand of some sort of metal! Lots of bending and I even made the jump rings from scratch! It took about 2.5 hours and was really interesting how a single strand of wire can actually end up as something I can wear. Most activities are included in the cost of staying. 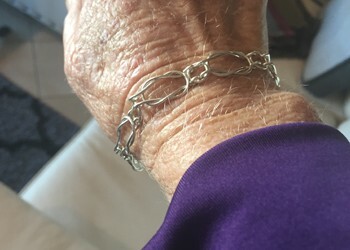 The bracelet, I had to buy the metal, and we do have to pay a nominal fee for the meals! The pancake breakfast includes eggs cooked to your liking, scrambled eggs, pancakes, almond pancakes, sausage, biscuits, gravy, ham, orange juice and coffee for a whopping $3.00 per person as long as we wear our name tags. See it is just like summer camp, we have badges that say our names and where we come from that we are encouraged to wear. I forget mine most of the time! Thats ok, I am pretty good at introducing myself. Today I played in my first league games of tennis where our park plays against other parks in the area. I played pretty well for a beginner but we did lose the match. I take the good from each situation – my serves are great and we actually won two games just from my serves, and I can scamper around the court pretty well most of the time getting the ball returned into play. So, tennis is going to be my passion while we are here; the weather is wonderful so why not. Off to another game of tennis! Posted in Arizona | Comments Off on Summer Camp for Grown Ups! So far the park is exactly what I was looking for; lots of activities, great people and better weather! Well the weather needs to improve but the sun was out this am and I took a short walk before I went to a new activity! Boot Camp. I want to get some strength in my arms so this should help! It looked easy enough as you go through 15 stations in 1 minute intervals. I was doing great and then at about station 14 I realized we were going to go around again! Ouch! But I did it and hopefully on Friday I can do it again. The end of the year was very busy with our stay in CA. We had great visits with friends and of course the family. 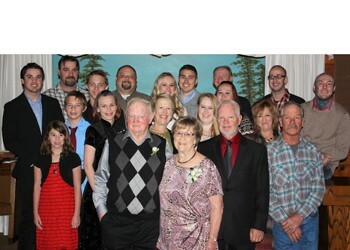 We celebrated 60 years of marriage with my parents with most of the family coming together. Christmas was beautiful. I helped Amy make a Carpenter family recipe of Lasagna for Christmas Eve Dinner with her inlaws! Everyone approved so its a go again next year! Stephanie is doing great and soon will be finding a new home to purchase in San Jose! Damn the price of real estate in the area is going insane again! With Christmas behind us Paul and I have left the state again for hopefully warmer weather! We arrived in Mesa, AZ on New Years Eve and it was slightly warmer. Bringing in the New Year at our new winter address and then on Friday we finally saw some great weather that lasted 2.5 days and now it is cold again with rain for the last 2-3 days! Yuck!